Haven't seen any photos yet, though I heard about it too. Saw the picture on FB. So I fished this Media tournament on Eagle Mountain and did not get a single bite all day long. I knew it was going to be tough and it was for a lot of people. But it seems there is always some people that can catch them. They are obviously a way better fisherman than I am, no argument. I know I will never know what the winner did to catch his fish. What is the general rule for winter fishing a cold water lake? I tried a lot of different things and nothing!! the deepest I fished was about 16ft. Was I not deep enough? I'm not looking for anyone's secretes but would like some advise as its very discouraging to not get a bite yet others bring in a limit. As with anything like this, it was all mainly luck, right place at the right time. I only had 2 bites all day, 1 short and this fish; the short fish was on a bladed jig. Big fish was caught on a jig in about 7ft of water, along a drop with some rocks on it. Fortunately the catch was witnessed by a fellow competitor (hopefully he doesn't talk too much, otherwise that area will be like musical chairs), so there's no doubt it came from Eagle Mountain. For the record, I tried all the normal stuff and areas, north to south, and only had 2 bites and some really cold fingers to show for it. This lake has really shown up in the last few years and if we avoid the spring monsoons, there's little doubt you'll see some really big strings this year. The real winners were the guys that actually figured them out to put a limit together. The top couple of guys are the real sticks for the day, as I was just the lucky one. Now, if we could get those guys to share some insight, that would be helpful to all. Congrats to Garrick and Brian on a tough day. 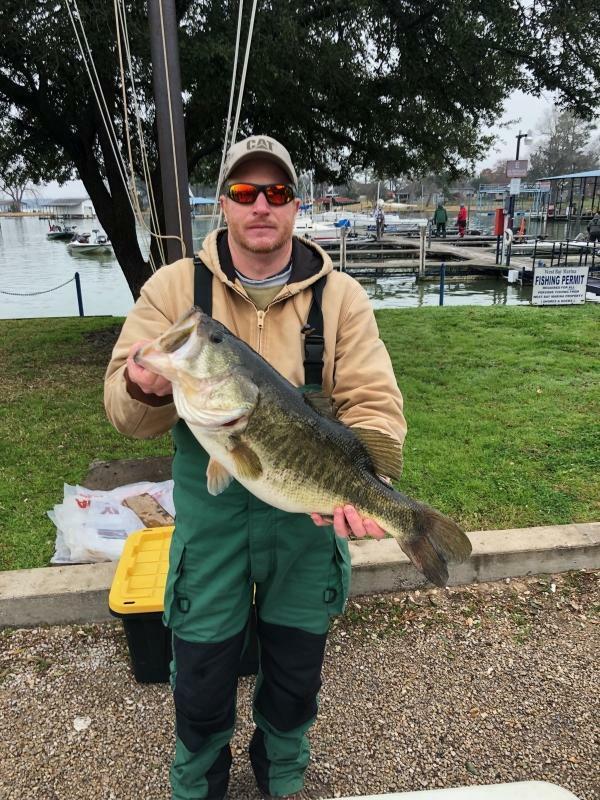 Great fish....even better in a tournament. Congrats. Darrel, you do realize that you were within a quarter pound of lake record. 11.62 is the record. "It is hard to soar with the eagles, when you are surrounded by turkeys"
Classy move here. Not a lot of guys would come forward with such information. That is a freaking tank. Awesome fish. Yesterday was certainly no walk in the park. I thought long and hard about dumping my lonely 4.5 pounder. Glad I didn't points wise.